Age-related macular degeneration is a serious eye condition which can lead to blindness. There are two types of age-related macular degeneration and unfortunately neither can be cured. Treatments are available which can limit the damage done to eyesight and prevent any further deterioration to your sight. It is very important to detect the condition early, so treatments have the best chance of working. As eyesight cannot be fully restored it is very important that the condition is picked up early to prevent blindness. New drugs are being developed so there is now a range of options available. This condition is the more common of the two types of AMD and is also the milder form. The AMD Alliance has stated that Dry AMD accounts for 85 to 90% of all AMD cases. The condition develops slowly over a period of time and usually causes only minor loss of eyesight. There is currently no treatment available for this kind of age-related macular degeneration, although stopping smoking, eating a healthy diet with plenty of antioxidants and vitamins will help to minimise the damage. However, there are not any medical treatments to cure dry AMD. Wet AMD is very serious and can cause a sudden loss of central vision, the central part of our eyesight. According to the AMD Alliance, wet AMD accounts for around 10 to 15% of all AMD cases. 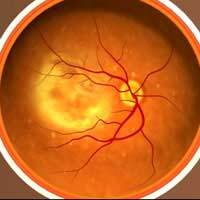 The condition is caused by the growth of blood vessels under the macula part of the eye. These vessels then leak, causing a blister to form on the eye. Scar tissue forms and this affects a person’s eyesight so that they cannot see clearly. Wet AMD affects the central part of eyesight. There are three types of treatment available for people with wet AMD. These are laser photocoagulation (heat laser), photo dynamic therapy and anti-vascular endothelial growth factor (VEGF) drugs. This laser treatment is a surgical procedure which uses a hot laser to seal or stop the progression of abnormal blood vessels which cause the AMD. The laser becomes hot when it hits the parts of the retina which need treatment. This stops the leaky vessels from growing and prevents any further damage to eyesight. The laser causes a scar on the retina which creates a blind spot in the person’s vision. Eyesight cannot be fully restored by the treatment but it prevents any further loss of sight. The brand name for photo dynamic therapy is Visudyne. This is another type of laser surgery. The laser is used with an intravenous light-sensitive drug to slow down and stop the abnormal blood vessels. Unlike laser photocoagulation this treatment does not create a blind spot. The light is shone straight onto the damaged tissue and the drug builds up in the damaged cells, avoiding the healthy cells. There has been much in the press recently about two anti-VEGF drugs called Macugen and Lucentis. These drugs work by targeting the proteins which trigger the abnormal blood vessels which cause AMD to develop. These drugs are taken by injecting them directly into the eye. This is repeated every four to six weeks. As with other treatments they cannot restore eyesight to the same level as before the AMD developed. But they do minimise the level of sight loss so patients can retain some of their sight.